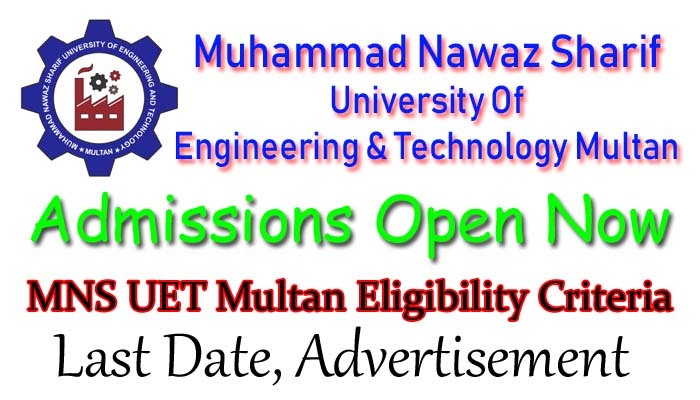 Muhammad Nawaz Sharif University Of Engineering & Technology Multan Admission 2019 complete information is here for all the students who are willing to get admission in MNS UET Admissin 2019 like last date, form download, entry test, merit lists, advertisement and much more. MNS UET Spring Admission 2019 advertisement contains all the information like eligibility criteria and scholarships. MNSUET Is inviting application for undergraduate, post-graduate, Mphil and PhD programs in various subjects. MNSUET Undergraduate Admission 2019 are offered on 100% merit and university have a proper admission process through that every students have to apply for admission. MNSUET was established in 2012 in multan by Muhammad Shehbaz Sharif who was the CM of Punjab that time. MNSUET is becoming the famous and top engineering university in Punjab with its passion and dedication. It is producing engineering with fine qualities who are serving the country in their fields. Muhammad Nawaz Sharif UET Multan is affiliated with Higher education commission HEC and Pakistan engineering council PEC. MNS UET Multan Admission 2019 will be granted after entry test conduct by UET and candidates will be selected after interview. 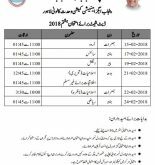 MNS UET Multan Spring Admission 2019 merit list will be available here very soon. University of Engineering & Technology Multan is famous engineering institute that is providing quality education the students so that they can serve the country with their skills. University is named on the pakistan’s ex PM Mian Muhammad Nawaz Sharif and it have all the facilities that a students wishes to have in its institute. There are airy classrooms, clean labs, canteen, library, computer labs, play grounds, greeny lawns, highly trained staff and well educated PhD faculty. To get admission in bsc engineering programs candidate must have 60% minimum marks in F.Sc Pre Engineering. Candidates having minimum 50% marks in intermediate are eligibility to get admission in all engineering technology programs. Candidate must have 2.20 CGPA or above in previous degree to get admission in M.Sc. to get admission chemical engineering students should have done B.sc chemical engineering with 2.20 CGPA. All the students must have to pass the ECAT or HAT Test to get admission in MNS UET Multan. There is complete procedure to apply for admission in UET Multan that every student have to pass. Students who are interested to apply for admission in UET Multan should buy a Rs 1000/- Prospecuts from admission office. Fill the application form with great care and you can also read prospectus so that you can know about university life, rules and regulations. Attach all te required documents along with admission form and submit to the admission office before last date ends. No forms will be entertained after due date. False information providing may lead you to cancel the admission at any stage so be careful while filling the form. Muhammad Nawaz Sharif Univeristy Of Engineering & Technology Multan is offering Bachelors admissions in engineering. You can get download MNS UET Multan Bachelors Admission 2019 form, eligibility criteria, last date to apply and scholarships details here. Only students who wants to make their future bright with dedication, hardwork and passion should apply for admission because MNS UET is well reputed institute that will provide a chance to grow your skills. Self motivated students are invited to submit admission form who have complete intermediate with engineering subjects. 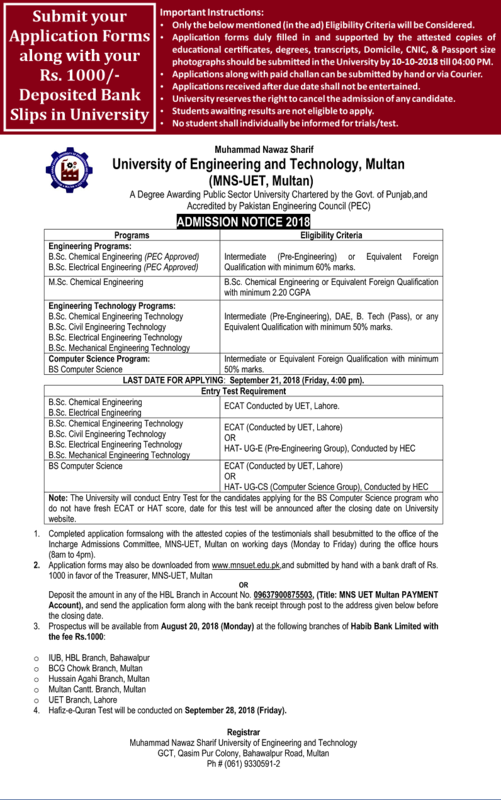 Note that this information related to MNS UET Multan Admission 2019 Last Date is collected from different online souces but for authentic news & updates of MNS UET Msc Chemical Engineering Admission 2019 visit official website. You can also get prospectus from following HBL bank branches by paying its fee. Webstudy.pk is best place for students to download guess papers, model papers, past papers & important notes of each class and subject. You can also get information about all universities admission, eligibility criteria, merit list and scholarships along with annual results all boards in Pakistan.